Happy Christmas everyone… a LOT has happened since my last blog post. There have been three more brews, three beers kegged, three more planned, and a bunch of trips to some incredible breweries in Atlanta and Athens. This blog has the potential to be 20 pages long, but instead I think I’m going to break the content into two posts. A good place to start would be to talk about the first three batches that we have trialled. The plan for this beer during the design phase was to brew a beer that was soft, packed full of flavor and hugely aromatic. Some early tasting during fermentation gave some really good signs…it was producing the soft profile that I was looking for and even before dry hopping the aroma was on par. After dry hopping it got closer and closer to all those attributes that were planned. 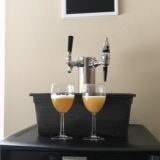 With some slight conditioning the DIPA was ready to be kegged. 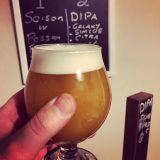 Needless to say, I’m seriously happy with the outcome of the DIPA. It has a consistent haze profile; it’s hugely balanced with aromas and flavors of pineapple, grapefruit, passion fruit and citrus. Of course it’s one thing to be happy with what you’ve produced but other people have to enjoy it too! Success… the DIPA was a hit! For those who have tasted it, the feedback has been amazing. For that, I am humbled. Just like the DIPA the IPA was planned to have a flavor profile that was soft, hugely aromatic and with a balanced finish. Instead of going with the Vermont Ale yeast, I chose the US-04 strain which also has a low attenuation percentage. But unfortunately it didn’t produce the outcome that I wanted. Towards the end of fermentation I started detecting some higher alcohols which is something that I personally don’t enjoy at all! The hop aromas were there which has given me confidence that I’m on the right track. 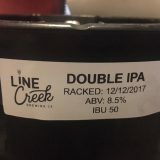 I want to make amazing beer for Line Creek Brewing and Peachtree City; I feel that I’m close with the IPA and with just a few changes to be made; we’ll get there. As I mentioned in a previous post, Saisons are one of my favorite styles. They are really versatile and as long as the yeast behaves itself the beer can only be good! 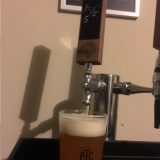 When I previously brewed this beer I used whole passion fruits which produce an amazingly clean flavor but they are also really delicate when infused into a beer. It’s because of this, that it’s necessary to use a whole bunch…18 pieces per 5 gallons! That’s not really going to be possible on a 60BBL batch! With that in mind I used a really high-quality passion fruit puree that was aseptic…this means that it can be added post fermentation without the risk of infection to the beer. 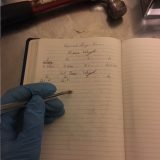 It was tricky to dose it into the three kegs of Saison but with a little bit of math I was able to get there! I didn’t anticipate the puree to drop out of suspension in the kegs but that’s exactly what happened! This wasn’t a huge issue but it gave the impression from the first pour of the beer that it was REALLY tart. As soon as the puree was stripped out, the beer revealed itself. Thankfully the aromatics from the yeast aren’t dominated by the passion fruit and the slight banana and clove aromas are detectable…as well as the passion fruit of course. It’s a super fresh smelling beer that we feel is going to be a huge hit for us. Whilst I was kegging the first three batches I was also busy brewing the next three… first up was the All Day Breakfast Stout (ADBS). 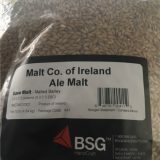 I was really happy to be able to get some Irish Ale Malt here in Georgia and I’m excited to be able to use it in our ADBS and Irish Red. The Malting Company of Ireland are the malsters that produce the Ale Malt and it’s only a stone’s throw away from where I grew up in Cork. The idea around this beer is to have something that’s got a solid roast profile but nothing over the top. This for me is achieved by first using Weyermann’s Carafa 3 instead of Roasted Barley, by adding actual vanilla pods and softening the whole beer out with a healthy dose of nitrogen. But, it wouldn’t be breakfast without some coffee…more importantly local coffee! We began talking to Fire Mountain recently and we are super excited to use their amazing coffee in our beer. 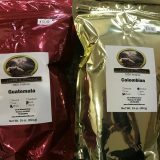 With some discussion we are going to try the Guatemala and Colombian blends first. I’m looking for a coffee that has low acidity as well as producing a slight nut profile and I know that one if not two of these is going to be awesome in the ADBS. At the moment we are toying with the idea of either having a lager style beer or a blonde style ale… so hey…we’ve got a pilot system…let’s try both! First up was the Blonde, just like the lager style beer we want this beer to be accessible. With that in mind I’ve gone for a solid malt base and a low level IBU. This beer was designed around the idea of not being all about the hops, not being all about the malt or yeast but instead a really balanced blend of all of those. The blonde isn’t dry hopped but instead has a good blend of some old favorites and some relatively new hops. Unlike the Blonde Style Ale, the turn around on this beer will be 4-5 weeks instead of the blondes 2-3 weeks. To get the beer through fermentation I’ve gone for a yeast strain that I’ve got a lot of experience with and one that I know can produce a great lager style beer. This beer demands time and lots of patience! Push it too early and you can be left with a beer that’s got a high level of astringency and lots of sulphur. Typically this beer would be fermented at 48f but I like to push it to 53.6f. Not because of fermentation time but because of the flavor profile it produces. It gives a slightly fruity aroma but also a crisp mouth feel. Thanks to everyone again for reading my blog posts and for the fine people of PTC for being so accomdating to Lucy and I. I hope you all had an amazing Christmas. Part 2 is in the works! Hello Jason, can’t wait for the brewery to open. Most of the beer in GA has kinda sucked compared to places I’ve lived but it is starting to get better. The question I have is, I see your developing the Line Creek Signature beers, which is great., but will you be developing other DIPAs, IPAs, Stounts with a variety of IBUs (lower the better), flavors and ABVs in the first year? I hope the all day breakfast stout will be a year round beer! Dark beers in summer are just fine with me. I can’t wait to try these brews! Happy Christmas and New Years Zach.. I’m right there with you on drinking stouts and roasty beers all year round… Who says a breakfast stout has to be seasonal!! !